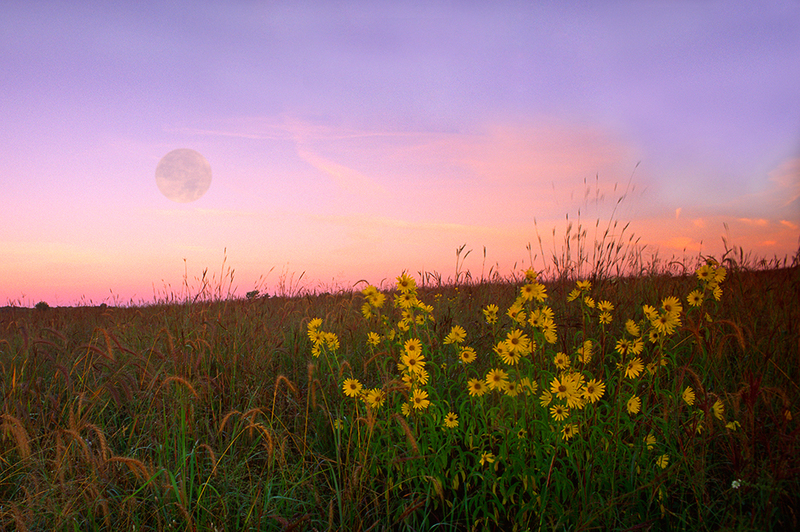 State Parks were created to protect outstanding natural places. Help us keep them that way. OHV stands for Off-Highway Vehicle and is the umbrella term for a variety of vehicles designed for driving off road. OHVs come in all shapes and sizes with anywhere from 2 to 8 wheels, or even tracks. They include ATVs, dirt bikes, off-road trucks. Various efforts have targeted different types of OHVs for use in state parks. 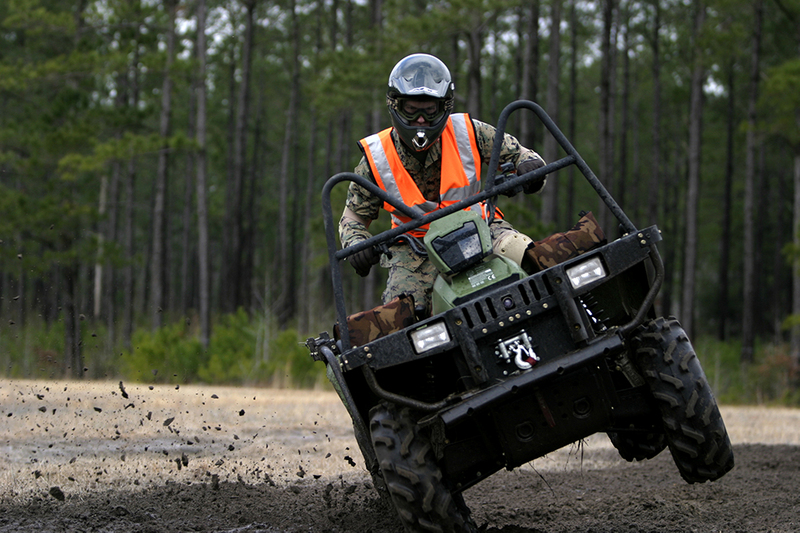 All-terrain vehicles are commonly known as ATVs. They come in different classes with class 1 being legal for children starting at age 10 to ride on public lands with a parent or guardian. Also known as off-highway motorcycles, that are designed for rough terrain. Such as Jeeps. These are generally used for slower, tactical maneuvers over boulders and driving through rugged, dirt roads. State Parks are special places designed to protect unique natural and cultural landscapes. Off-highway vehicles such as ATVs pose unique safety challenges. They are deceptively dangerous in part because they are unstable on paved roads, causing them to roll unexpectedly. When they do roll the crash results in death more often than motorcycles, according to Reuters. According to a report by ATVSafety.gov, in 2016, there were an estimated 101,200 ATV-related, emergency department-treated injuries in the United States. An estimated 26 percent of these involved children younger than 16 years of age. Now imagine these motorized vehicles being ridden around within a busy campground with children learning to ride their bicycles and running around enjoying the freedom of the outdoors. This is a recipe for disaster. Study after study has demonstrated the many dangers off-highway vehicles (OHVs) pose to the natural environment, ranging from soil erosion, soil compaction, spreading weeds, trampling vegetation, disrupting watersheds, fragmenting habitat, displacing wildlife, and creating noise pollution. Noise pollution is often an overlooked problem, but it’s one that is pervasive and it has severe impacts on both human health and ecological health. According to the EPA, noise is related to illnesses, high blood pressure, speech interference, hearing loss, sleep disruption, and lost productivity. Preserving natural sounds by limited noise is an important consideration in the management of state parks and an issue that the National Parks Services takes seriously. 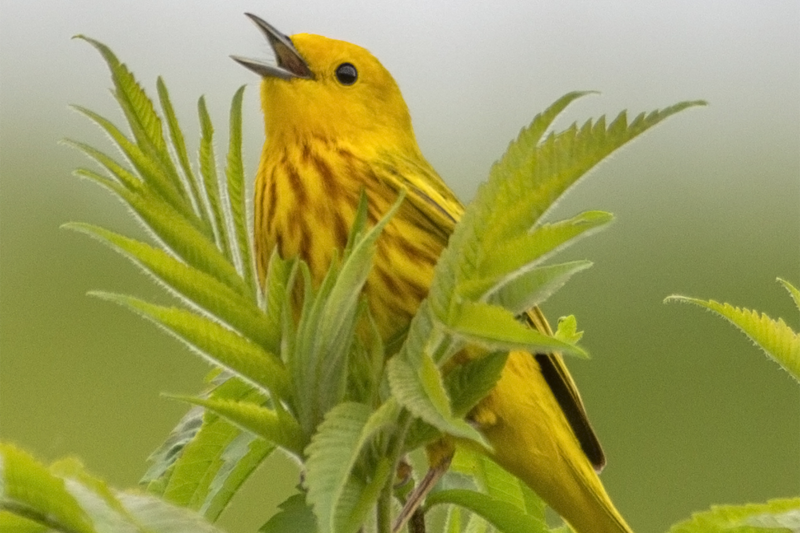 Wildlife is also impacted by noise in ways that can ultimately threatens the ecological balance of natural places (visit National Park Service webpage for more info). State Parks are one of the few places to experience natural sounds free of human-caused noises and the loss of this would be very unfortunate for people and wildlife. Off-highway vehicles (OHVs) are popular in Minnesota, but remain a niche activity. While there are about 300,000 OHVs registered in Minnesota, only about 5% of Minnesotans own one. In contrast, state parks are widely used. The DNR estimates about 30% of Minnesotans visit a state park every year, and state parks host over 10 million annual visitors, including 1 million overnight guests. And yet, OHV opportunities vastly outweigh state park opportunities. There are over 4 million acres of state forests in Minnesota, of which about 3,966,000 acres are open to OHVs in some capacity. The state of Minnesota directly supports about 2,500 miles of OHV trail. Conversely, there are only 214,000 acres of state park land in Minnesota, on which the DNR maintains about 1,000 miles of hiking trails. How are state parks being threatened? The attempts to bring OHVs into state parks have come in a variety of ways over the years. The DNR began a planning process to explore options for the location of an OHV campground that includes Hayes Lake State Park as an option, despite OHV use currently being against the law within the state park. The DNR began the process of revising state park rules, with interest in responding to changing visitor needs such as OHVs. Rule changes often take years and as yet no further action seems to have happened. Some ATV users successfully influenced the master planning process for Lake Vermilion-Soudan Underground State Park to include a recommendation for ATV trail connections and allowance of ATVs in a campground, even though such use went against the state park rules. Snowmobiles are allowed in some state parks on designated trails. There are certainly noise impacts caused by snowmobiles but their use has been allowed since legislation was passed decades ago, making it hard to reverse. However, there are a number of ways that snowmobiles have less impact than off-highway vehicles such as ATVs. Most state park campgrounds are closed in the winter, and visitation is much lower, so concerns over sound and displacement are minimized. In addition, the snowpack serves as a protective blanket for the land, so snowmobiles don’t have the same negative environmental impacts that ATVs do. The law gives park managers broad leeway to close snowmobile trails whenever they worry the snow conditions are such that the natural resources within the park could be damaged. How are OHVs/ATVs any different than Harley motorcycles? Yes, it’s true that some motorcycles can be loud and disruptive. We certainly do not encourage people to come to state parks to rev their motorcycles.Similarly, we do not want to encourage people to come to state parks if their primary objective is motorized recreation. Additionally, off-highway vehicles such as ATVs, present a whole other level of concerns. They are a separate class of vehicle designed less for transportation and more for thrills. This is an important distinction. According to ATV Safety Institute, ATVs are designed to be operated only on trails and Kids Health says you should never ride on paved surfaces or public roads (except to cross them). Reuters further explains that ATVs are different from motorcycles in that they are more deadly. See our section above about the environmental impacts of OHVs such as ATVs that go beyond the noise impacts. Noise is certainly a major impact that causes conflicts with other users. However, even if off-highway vehicles made no noise at all they would continue to pose a safety threat for visitors. They also would continue to have disastrous impacts on erosion, water quality and wildlife habitat. All these reasons combined is why state parks have always been defined to be places where off-highway vehicles are not compatible. Who is pushing for this? There are a number of local and national off-highway vehicle groups that are pushing to create more trails and open up places that have previously been considered incompatible. Even as off-highway vehicle use is relatively stagnate, these local groups have been influential in expanding state resources toward this niche activity. Groups from the local area surrounding the targeted parks seem to be pushing for this use. While we appreciate local involvement with state parks, as demonstrated by our support for Friends Groups, it is important to remember that state parks are different from local or even regional parks in that they are state-wide assets, funded by the state, to preserve our state’s natural heritage. Therefore, any changes to state park definitions should not be done to cater to a small, local contingency. What about State Recreation Areas? The Minnesota Outdoor Recreation Act makes a clear distinction between state parks and state recreation areas (SRAs), with stricter protections for state parks’ conservation. While Minnesota state parks are defined as places where recreation is limited to activities which do not cause material disturbance (M.S. 86A Subd. 2), state recreation areas allow for much broader use and are intended “to provide a broad selection of outdoor recreation opportunities in a natural setting which may be used by large numbers of people,” (M.S. 86A Subd. 3). There is a one SRA that was established and designed specifically for off-highway vehicle use, called the Iron Range OHV SRA. None of the other seven SRAs (listed below) currently allow off-highway vehicles. Additionally a section of Tettegouche State Park was added and given the technical designation of SRA, allowing for an ATV trail to continue to be used on the land. In practice, visitors would not realize this part of the park has a different designation, which causes some confusion. The Minnesota Outdoor Recreation Act of 1975 is clear that state parks are not meant to accommodate every kind of recreational use and in fact the only permissible uses are those that do not cause material disturbance to the natural features of parks. Most State Park visitors (72%) say that enjoying the smells and sounds of nature is very important to their visit and most (60%) oppose OHVs in state parks. Meanwhile only 12 percent of visitors support the idea of allowing OHVs in state parks. There is currently 1,800% more state-owned land available for OHV users (in the form of 4,000,000 acres of State Forests) than for state park visitors (214,252 acres). 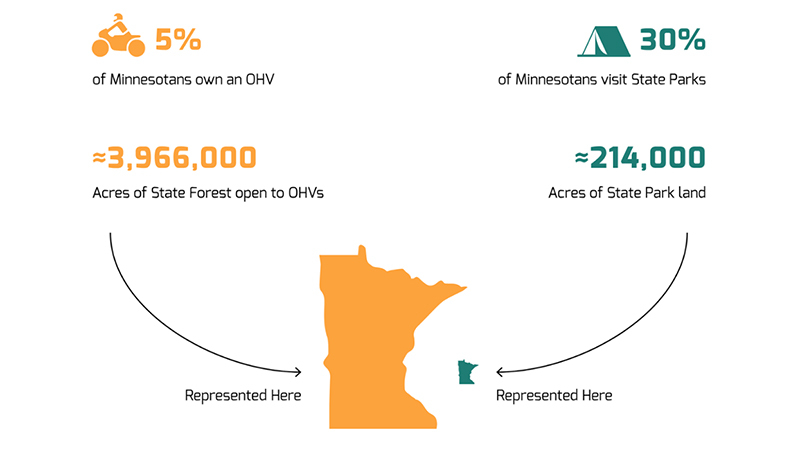 That statistic alone is staggering, but paired with the fact that only five percent of Minnesotans even own an OHV, while 30 percent of Minnesotans visit state parks, it’s undeniable that there is a disproportionate use of land.